Know of any other alternatives? Link to them in the comments below. Adobe Photoshop is one of the most dominant image editing programs available. It is so widely used, that even those that have never used it have no doubt heard the term “photoshopped”. 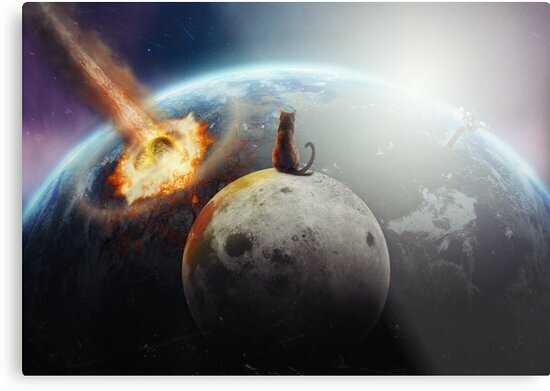 Aside from image editing, Photoshop is also great for digital painting, web page layouts, mockups, typography, illustration, and even placing your cat on the moon to watch its nefarious plan in action. Regardless of its popularity, there are many reasons you may consider an alternative. While there are many powerful features in Photoshop, it can be very hard on your computer’s resources, and you may not like the monthly subscription required to use it. So here’s a list of alternatives that we think are worthing checking out. Gimp (GNU Image Manipulation Program) is open-source and considered one the most powerful free image editors in the world. It is available on a variety of operating systems, such as linux, and is expandable with a wide variety of plugins. Gimp has a customizable interface. While not very sleek looking, it gets the job done. Even though you can contribute to its development, new updates are often slow to come. As of now there is no 16 bit per channel color support, there is no native RAW support (without plugin), and is currently lacking non-destructive editing. Notes: Many plugins & scripts, opens PSD files, converts PS brushes (ABR) for use, content aware like features. With 5 years of development, this newcomer has already won Mac App of the year in 2015. The customizable interface is sleek and powerful, and there are many features that might might make the most die-hard Photoshop fan take a second look. One of the most unique features is “Personas”, which are specific environments inside the app used when performing certain actions, such as photo editing, liquify, developing raw images, and exporting. There is non-destructive editing, adjustment layers, vector drawing, powerful selection tools, masks/layers, and much more. A Windows version is currently in beta development. Notes: Dedicated RAW editing support, 16 bit per channel editing, multiple color modes, open/save/edit PSD files, ABR brush support, extensions for Apple Photos. 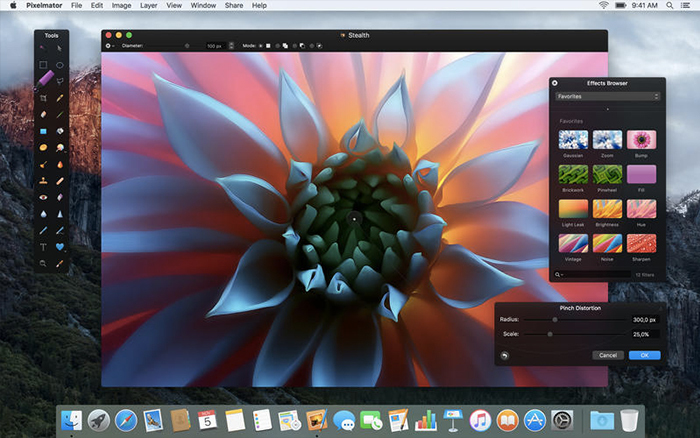 Billed as a full featured image processing and painting app, Pixelmator is a great bang for the buck alternative. All of the favorites are here; non-destructive editing, layers/masks, liquify, multiple selection tools, customizable effects, layer styles, a pixel-art tool, and a quick shortcut even turns the app into a vector drawing app. There is also a mobile (IOS) version available as well. Notes: Dedicated RAW editing support, 16 bit support, CMYK proofing, open/save/edit PSD files, ABR brush support, retouch and distort extensions for Apple Photos. From the makers of Corel Painter, this image editing program is an affordable alternative with a great feature set. 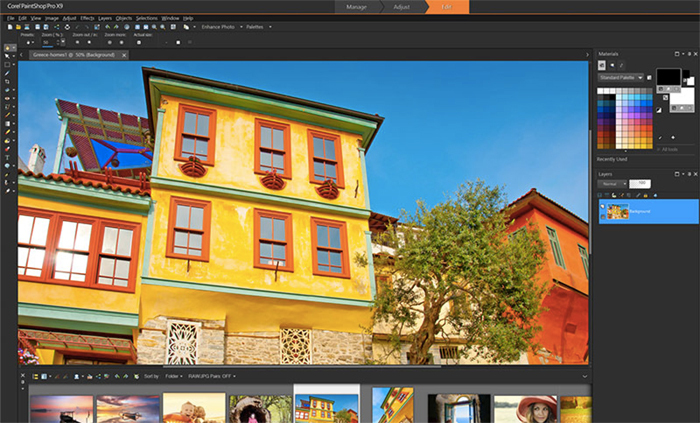 Along with many of the standard tools, Paintshop-Pro has layers/masks, plugins and scripts, batch editing, some social media features, and a built-in learning center. Notes: Dedicated RAW editing support, 16 bit support, open/save/edit PSD files, ABR brush support, and some CMYK color support. Aside from being a very capable image editing program, Pixlr is the only alternative in this list that can boast being cross-platform as well as mobile (ios, android), and even as a web application. There are many effects and blending tools, layers and influence masks, and a variety of selection tools. The desktop version is a subscription service, but it costs less than a cup of coffee each month. Notes: No RAW, 16 bit, or CMYK output as of yet, but the app can open PSD files.